Up for sale/trade are the following in .45 Colt, local FTF Greenville Woodruff Rd area. I would prefer one deal for all. Welcoming offers or fair trades for .223 Rem/5.56 or .308 Win (brass/boxer/non-corrosive only). Still available. Somebody make an offer before I start shopping for a 45! 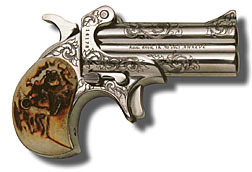 Or this Mare's Leg... maybe if it would handle the Casull. Tigerstripe, now look what you've done! Back to topic, still for sale a bunch of 45 Colt. Any interest out there? Bump. WTT maybe for .38 SPL .357 Mag, then I'll have to shop for a different gun. Darn shame your not closer to Summerville, or I'd take it all off your hands. It's just sitting here nice and safe in a can. I'll PM you next time I plan a vacation down your way. Still for sale/trade... I think... been in a can since OP. Item #4 are reloads so they are for pulling components only. Ignore listed prices - make a current fair trade offer. Will consider .38 SPL, .308 WIN, .45 ACP, .22 LR, or accessories of any sort. Meet along I-385 corridor, at Belton GC, or at Philsons.